Vibiana never had a name until she became a Christian. Her family always called her Four-Girl because she was the fourth daughter and her grandfather refused to name her or call her anything else. Because she was thought right off to be a devil by her grandfather, she decided to put on a devil's face thanks to the advice of a raccoon. A series of events leads her to become a Christian, mainly for selfish reasons, but all the time guided by this raccoon that is seemingly possessed by some sort of ancient spirit. Deemed Vibiana, she leaves her home and becomes more of a Christian and begins to see vision of Joan of Arc. The more she learns about the woman, the more she wishes to be like her. Torn between her countrymen and the Christians, she finds that she has been given more with Christianity and will die before giving up the faith that has given her more reason to live. I love the connection between the two books. Little Bao sees Four-Girl one day in the book Boxers and I recognized the girl straight away in this book, Saints. The irony is also that he at the time decides he would love to marry her, for she has a face set like the masks he enjoys at the fairs. Of course, when encountered later, he must make a hard choice when he encounters her as a Christian. I felt pity for Vibiana throughout the book, as she has been put in a situation at home that she readily leaves for Christianity. Her reasoning at first is a childish one, wanting the cookies that she gets when she goes to listen about the religion. 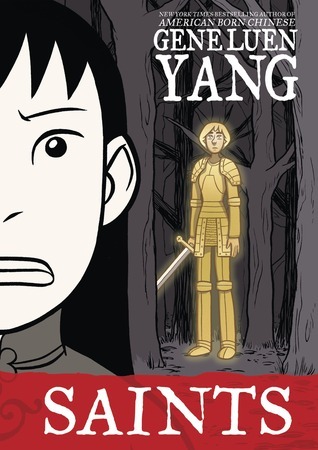 Quickly, she becomes immersed in it and with the ghost of Joan of Arc urging her forward she finds a stable footing in Christianity as well as the symbolism behind all that is going on in China. Saints is a book that has the reader stepping into another pair of shoes set in a time of rebellion and violence. I love the dichotomy between Boxers and Saints. How one choice can make that much of a difference in the path life leads you down. The illustrations are fantastic and the characterization really makes you care for Vibiana as well as others throughout the story. Final Verdict: Definitely a duo of books you should not miss, especially if you are a fan of graphic novels. This doesn't sound like a book that I would normally pick up, but your review has me intrigued.